It shipped! It shipped! It finally shipped. My Weavebird v2 is on it’s way. No more stalking email for notification, no more exasperated phone calls. All 348 pounds and 10 boxes are showing up on the UPS tracking. Now I’ll be stalking UPS. All this excitement may be short lived. There isn’t a scheduled delivery date showing up, at least not yet, so there’s still no guarantee that it will get here before The Man goes out of town for 2 1/2 weeks. If worse comes to worse, I can hire someone to help me put it together. And the loom will also have some upgrades. “Your loom is equipped with a new Stainless Steel Cable system and redesigned Weight Board”, which will make it quieter than the ones who came before it. So excited! I’m counting my chickens before they hatch. Again. So, I ordered my loom on Sept 17. I received an email on Tuesday Sept 21 that the anticipated ship date was 3 weeks. I would get an email when it shipped, with a tracking number so I could stalk it. October 12 came and I began checking my email quite a few times during the day. By October 15, I hated my email. Didn’t even want to check it, yet I did anyway. Still no notice. I placed a call. “Look, I know anticipated doesn’t mean a definite date but could I get an update on a newly anticipated ship date?” He’d meant to call me to let me know, one of the packing guys was out on sick leave and it would likely ship next week. Which is this week. Yesterday, I got another email. They hope to ship it early next week. It seems my loom is going to have an updated piece on it that will reduce the noise by a minimum of 50%. The best that I can understand is the delay is updating the instructions. Come Monday, I will be back to wearing out Gmail to look for that grand ship notice. Now I’m all for waiting on things to be done properly. I don’t want the loom sooner if it means that I’m going to receive less than what I’m expecting, or improperly done parts or instructions. The problem here is that it will take 5-7 days from the day it ships until the day I get it. Being as the loom is coming clear across the country, I’m planning on 7 days. Is that business days? Actual days? I’m hoping for actual. In my mind, early next week means Monday or Tuesday. Wednesday is mid-week, and Thursday and Friday are late week. So let’s say it ships no later than Tuesday. If it’s actual days, it will get here the following Tuesday, 2 days before hubby goes out of town. Later than that and I’m screwed as far as getting it put together. If it’s business days, then I’m really screwed. Hubby won’t be back until the 19th of November. Do you know how much torture it would be to have loom parts just sitting there, taunting me, for 2 weeks?! At this point, I’m counting those chickens, ships no later than Tuesday and actual days. The loom in the previous post has been sold. It’s still here as she has to borrow a truck to take it home in but she’s put money on it so I consider it sold. I have one loom left until the new one gets here. The estimated ship date is quickly approaching on that one and I’m getting more and more anxious as each day passes. I’m trying to remember that “anticipated” ship date doesn’t mean “definite” ship date but it’s hard not to be excited. The room is ready, it just needs a loom! I should be using my time wisely and planning definite projects now that the room is ready. Chances are, I’ll procrastinate like normal. Speaking of being wise, I’m a little annoyed today. I posted to my guild’s yahoo group that I was selling the Mac and included my full name and phone number. It’s a private group, you have to be a member of the guild. All guild members have access to my full name and phone number in our members guide so this isn’t a big deal. What annoyed me was that someone pasted my entire message to a couple of other groups, including one that I’m a member of. Entire message including my name and phone number. While I appreciate that she had the best of intentions, I didn’t exactly want my name and number appearing in places that I didn’t know about. I asked the moderator of the one group I’m a member of to please delete those messages, which she kindly did. The other groups I’m not a member of so I emailed the original copy-and-paster and asked her to have them removed from any other groups she copied to. For those that get their yahoo messages in email instead of checking the website, that damage has been done and there’s no way to undo it unfortunately. There’s two lessons to be learned here. The first being (mine) no matter that the group is private, I shouldn’t have put my full name and phone number out there. The second being (someone else) even with the best of intentions, you shouldn’t share someone else’s info without their permission. Work has also thrown me a humdinger. I started to type the whole explanation here but maybe that’s not wise. So, short version is that I have to start my own company in order to get paid after Sept 30. Starting a company doesn’t exactly happen overnight so until CA decides to grace me with some official paperwork, I don’t get to pass Go. On the positive side, I guess I can officially say I’m a business owner. Woohoo? I read for sale ads where people say something to the effect of “oh, I hate to sell this but I’m selling this loom” and I think eh, they’re just saying that. Now, I know what they mean. It makes me sad that I’m trying to sell this loom. I love this loom. But, I’m sure I will love the new loom more. (Right?) 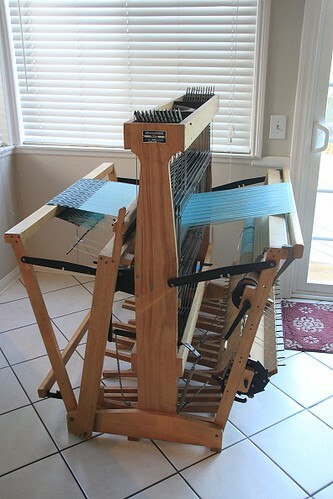 So yeah, selling my Macomber 12s/16t 40″ weaving loom. It has a sectional and a plain warp beam. There’s no way I can ship it as we no longer have a truck to haul anything in. I have a warp on it now in case someone wants to test weave but I’ll be cutting it off when I sell the loom. Price is $900. We’re northwest of Los Angeles if anyone is interested. More pics and info on Ravelry, or let me know if you want me to email them to you.